Your greatest organizational asset is your leadership's talent. New Century Management brings distinctive innovation to our approach to leadership and management education. For more than 15 years, our learning specialists have taught thousands of people in every major industry. Our overall rating from workshop participants is an outstanding 4.6 on a 5-point scale. We consistently get rave reviews. New Century Management's learning specialists are highly experienced managers who share their wealth of practical experiences. 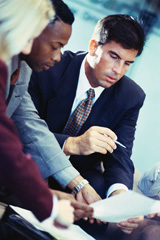 Our primary focus is to ensure that our leadership programs meet all of your requirements. Each of our 14 leadership workshops is competency based and emphasizes critical skills. Our workshops are content-rich, highly interactive, and can be customized. Select from the workshops below to see the complete course descriptions, objectives, and benefits.